She shook my hand with vigour and sincerity while maintaining eye contact and a wide smile the whole time. The way she exuded poise, radiance and confidence, I would easily have believed that she was a CEO or a high ranking manager in a multinational company. Her two eldest kids, aged 22 and 19, were there right beside her. Amiable and well-mannered, they made an impression in me and I was struck by the closely knitted bond they had with her. When she was having her makeup done in a corner, the daughter took out a phone to capture a shot and said to her "Mum, you look great". Before the show, they told Mum to relax and helped her to calm her nerves by chatting and taking some pictures. During the show, they were there right beside the camera, giving Mum their wholehearted support. They might not have uttered a sound but their presence made all the difference. After the show, they walked up and said "Mum, you did a wonderful job". I could feel their pride in her and the joy that runs in this family. 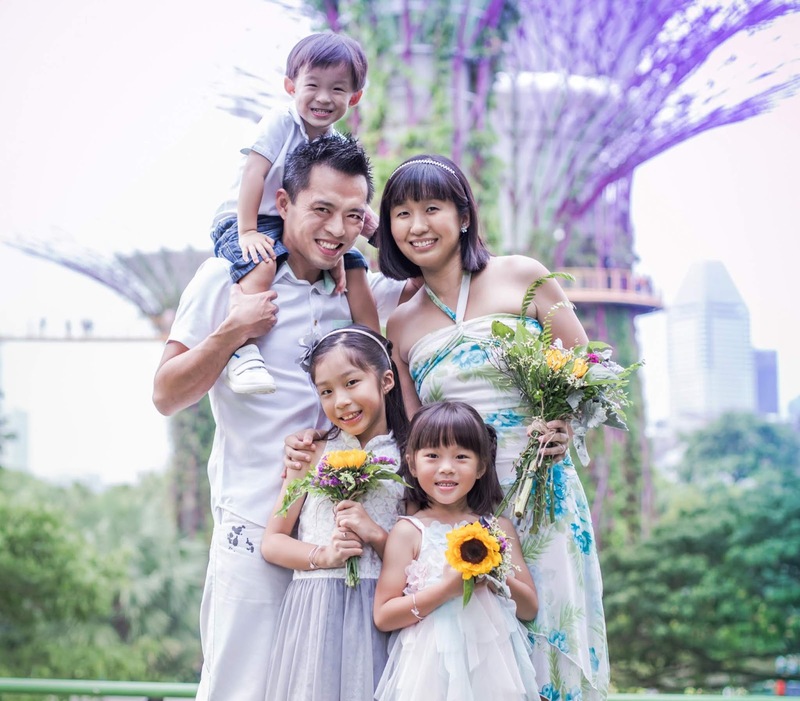 Meet Cherry - The beautiful mum of four who has been a stay-at-home mum for the past 15 years. She gave up her job as a teacher so that she could focus on looking after her children. Since that day, there was never a day that she looked back or regretted her decision. 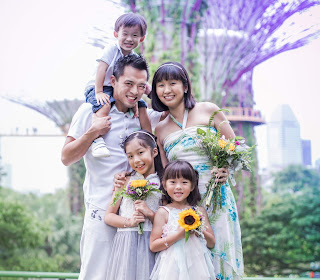 I gained a lot by being a guest speaker on Talking Point this week and was glad that I finally had a chance to share my story as a SAHM with fellow Singaporeans. Every inch of me felt thankful for this precious opportunity and just watching the video of a day in my life brought tears to my eyes and reminded me just how blessed I am to be able to walk this journey. Most of all, I am happy that it allowed me to get to know Cherry because 15 years down the road, that is where I want to be. A strong mum who shares an invisible cord and unbreakable bond with her children. A thankful mum who goes to bed feeling rewarded and contented each night. A happy mum who believes that life is beautiful and every moment worth living. 15 years down the road, where do you want to be? So, the crew came over to film a day of our life and the kids and I actually enjoyed the whole experience. When we asked why they chose me out of so many SAHMs out there, the reply was they felt that I had a compelling story to share. I must say it was destined that things happened the way they did. The hubby is currently in Germany for a week and we initially wanted to tag along so as to revisit Europe, only to give up the plan when we realised that flight tickets alone would cost us a bomb. If I was not in Singapore, I wouldn't have had the chance to go on the show and said everything I wanted to say. Unlike the Canon commercial we did last year, this time round, we didn't have to act in the least and all we needed was to - be ourselves. Right, we were not compensated in any way this time but I knew in my heart that this was a rare chance and the perfect time for me to share my story as a SAHM with many others out there and debunk the myths that we watch TV or shake legs all day long. To the friend who said that I am a tai tai (read here to find out why I'm not) and can play mahjong all day long, yes I remember you and I am telling you that you don't know the truth. No, not at all. Because you don't have a kid yet. The final edited video you saw on TV might just be 10 minutes long but can you guess how long the filming took? 1 hour? 2 hours? Well, it took over 12 hours and two teams to execute all the filming. Gosia, the friendly Polish whom I could chat with as a friend, was the producer and she was there with me the whole time, other than going for a lunch break in between. The video was filmed in a way that it was like my video diary and whenever I was doing something, Gosia would ask me questions for me to answer on the spot. So for instance, when I was hanging the laundry, I was asked "What made you decide to be a SAHM?" When I was making breakfast, I was asked to share some funny anecdotes. When I was cooking, I was asked "Have you wondered about what your peers might be doing?" When I was feeding the kids, I had to answer "Do your friends and your family understand and support you?" When I was brushing their hair, I had to reply "How do you find time for yourself?" and so on. That went on for one whole day. You get the picture. I might be good at multi-tasking but it is not often that I have to cook, wash, clean, look after kids and yet think through my thoughts and speak coherently at the same time. So, that was really tough! Sometimes I got a little tongue tied and couldn't find the best way to express myself even though I knew what was going on in my mind. Or I was so distracted by the toddler that my field of thought simply got cut off. Nonetheless, you bet everything was not rehearsed at all. How could I, when I didn't know what would be asked of me. So, it turned out that the emotions were real, the expressions were real and the words were as real as can be. Yes, I'm really just a real person and a real mum trying to raise a happy family. Compared to the commercial filming, I would say that the setup this time was much faster and more hassle free. However, time was still needed to get the right lighting, camera angle and audio. Throughout the whole day, I was constantly on the move so you can imagine how these guys had to follow me around and yet ensure that they were capturing the required footage and sound. Yes, it's really not easy to be a part of production! For the first time, I was interviewed as a blogger and asked on the reasons why I decided to start A Happy Mum. I was so glad that even though the final video was so compressed, they decided to include a few seconds that showed me blogging on the computer and how this passion has turned into part of my life as a stay-at-home mum. Then there were also the scenes which took us a lot of effort to film but eventually got cut. For instance, they wanted me to demonstrate how to board a bus with two kids in tow, a stroller and bulky diaper bag (Right, I did this for The New Paper previously too). Likewise as to when I was buying groceries at the wet market, I had a GoPro camera attached to my stroller and I was so afraid that when I would damage it when I folded my stroller to go up the bus! It was also drizzling when we were filming the bus scene but my kids just saw it as a fun activity to cover themselves with the rain cover while walking to the bus stop. I was actually very thankful to see them being so at ease with the crew and all the cameras, these two are really naturals! For just a day, we felt like stars because everywhere we went, all eyes were on us and many passers-by had questions for us like "What are you filming? ", "Which day which channel?" and some of the stall keepers I know in the market would come up and say "Come come, young mummy, buy this from us", some would try to get into the frame and some even gave us discounts as a result. Woohoo! Yet, we were portraying a very truthful side of our life and that was what I liked about the experience. Why, we even danced together as a family on our Wii game when Gosia knew it was one of our recent favourite activities and asked if we mind doing it after dinner. Well, just too bad it was edited and our little dancing queens who made us laugh every time couldn't show you their moves on national TV. At the end of the day, what I said was what I really felt. Exhausted but happy. Seriously, if you are a SAHM too, you will know why I feel so tired yet so rewarded every day, won't you? A big thank you to the Talking Point team for making this experience so fun and memorable for us. The kids totally loved seeing themselves in the video and I can't tell you just how priceless it is to me. Thank you for deciding to tell our side of the story as stay-at-home mums and validating our efforts and contributions! You know, there were many more other things that I wanted to say on the show but due to my speech anxiety and a lack of time, I was not able to. So, I thought I might just pen them down here before I forget. Q: What made you become a SAHM? A: I didn't really dream to be one. In fact, back in school, I thought I would grow up to be an entrepreneur or a woman holding a managerial role in some big company. Fate decided that I should give up my job to follow my husband to Sweden when the navy sent him there for training. I took up a MBA and before I could finish my thesis, I got pregnant. My first child was born there and that was how I stepped onto this journey. You could say it was more of a destiny than an aspiration, but one thing I can say for sure, life has never been better ever since. Q: What made you continue to be a SAHM when you returned? A: I was asked many times on why I did not want to go back to work when I came back from Sweden, even though it was evident that I was 30 weeks pregnant and going to give birth for the second time. Friends and family were concerned and some could not really understand my choice. The thing is, I strongly believed that I was the best person to look after my kids and it wasn't fair that I was there with my first child through her formative years and yet pass my second one to a caregiver. I wanted to be there with my children through all their milestones, I want to be the first one to hear their first words, see their first teeth, and watch them take their first steps before they tumble into my chest. There is no way I can bear the pain of having to hear all these from a third party and the way I see it, I gave birth to them and I am the best person to look after them. Q: How has this journey been for you? A: It was tough in the beginning, especially being a first time parent and the fact that I was so far away from home. There were times when I felt lonely, frustrated and confused if this was the right path for me. However, I soon learnt to be an independent mum and over time, confidence grew and so did joy. It was easy to realise that having a child was the best thing that ever happened to me and because of that, my life was filled with purpose and meaning. So yes, I have to say this journey has been a most challenging and mind-boggling one, yet the most gratifying and fulfilling one in my life. Q: Do you sometimes feel misunderstood by others? A: Yes, a lot of the time. It just seems less common in Singapore for a woman of my age to stay home and look after the kids. People either assume that I am a tai tai, I have a filthy rich husband, I am uneducated and some even think that I am a freeloader who doesn't contribute anything to the economy or society. The thing is, after a while, I stopped caring about what people say, stopped being bothered by their misjudgement and stopped letting myself be affected by unfair remarks. As long as I know my family supports and understands me, that my kids love me deeply and enjoy having me around, that I am doing my utmost to build a happy family, I guess that is all that truly matters. Don't compare, just cherish, I always tell myself that. Q: How close are you to your children and do you think it will stay this way? A: They cried when I told them I had to be away for two hours for the Talking Point live show. Yes, they did, especially my big girl. I was told by my in-laws that when the little one saw the show on TV, she pointed to me and broke down in tears, saying "I want Mummy, I want Mummy". I don't know if you understand it, but that is just how close we are and how much we need each other. Some people might say it is for bad instead of for good, but as a SAHM, I am happy to know how strong our mother-and-child bond is and deep down, I actually hope it will stay this way for life. Even though they might not need me physically when they grow up and we will be apart more than we are together, I treasure this feeling of being important in their lives for now and I wish that our unbreakable bond will be everlasting. Q: Should the state recognise SAHMs for their work? A: Like I said, I am very blessed that being a SAHM is a personal choice. Thus, I am already very thankful for that and I don't crave for extras or think that I deserve more than what I already own. That said, I do know of SAHMs who are struggling to make ends meet and there are also people who are forced to stay home to take care of a sick elderly, a child with special needs and so on. It would indeed be nice if our country could recognise the work that we are doing at home even though we don't draw a salary per se. A family is the basic unit of a society. It's only when we stop having the mindset that "My kids are my kids. Your kids are yours" and for employers to stop thinking "Those are your domestic issues, not the company's" but instead realise that we are all interconnected in this place we call home, then can we move forward as a nation. Oh, and finally increase our total fertility rate by leaps and bounds to achieve the replacement rate of 2.1. Yes, I'm kind of an idealistic person, you know. Q: What do you think can be done to help relieve the burden of SAHMs? A: I would not go as far as saying that allowances can be given out or that the state should top up our CPFs. However, there are small steps that can be taken and these include childcare, healthcare, household, transportation subsidies or tax relief on the spouse. A little might go a long way for some families and these initiatives might greatly ease the burdens of those who are forced to become homemakers. It is a general misconception that SAHMs come from wealthy families and that is why we can stay at home. More often than not, it is a trade-off for us and surviving on one income means we tend to lead a more frugal lifestyle, for instance stay in a smaller house, drive an old car, go on less holidays or abstain from buying luxury goods. Q: Will you consider going back to the workforce? A: Yes, I've always thought about that but I tell myself to wait till the kids get older. I don't know when 'older' means but that will be the time when I realise I am sitting around for hours aimlessly each day. However, I definitely do not wish to join the rat race or attempt to climb up the corporate ladder and give up the time I get to spend with my kids. That, to me, is priceless and something that money can never afford. Everyone has only one childhood, if I miss out on seeing how my children grow up, the next thing I know, they are stepping into adolescence or adulthood and that is when I will totally regret it. So thanks but no thanks, I am happy with a flexible work arrangement that sets me free by 5pm everyday, or I might just decide to work part-time or work from home so I can continue to teach and nurture my kids. For now, I'll just continue to blog. Q: Have you ever regretted your choice? A: The truth? Never. I do have many bad days and I've hit my head on the wall, I've cried tears of frustration, I've banged my fist against the door and I've slapped myself in the face in this journey of motherhood. It ain't easy, ain't easy at all. The fact that I see my kids 24/7 means I experience both ups and downs every single day and sometimes, this roller coaster ride can be a little overwhelming. That said, I've never looked back or wished that I did not go overseas, did not give birth or did not decide to be a SAHM. In fact, I'm absolutely, positively sure that it was the best decision I have ever made and one that I'm actually happy to stick with for as long as I can. The reason? Very simple. I gave my kids life but they gave me a reason to live. For those who missed and would like to watch the show, the clip is now on XinMSN at http://xin.msn.com/…/vp-b360591c-cb54-49b5-bdb2-4d3bfdcee807 or on Toggle at http://www.toggle.sg/en/series/talking-point/ep9/323716. There will also be a repeat telecast on MediaCorp Channel 5 on 13 Mar (Fri) at 2:30pm. Summer! Your first paragragh already made me cry! I'm so glad that they chose you to represent the many voiceless SAHMs in Singapore. You were obviously the perfect choice and now everyone can see why! You've shown that while the job is tough, it is so so so worth it. And the smiles on the girls! You were all so natural. If you were nervous at all, it certainly did not show! You were calm and collected throughout. Thank you for this very honest sharing and for allowing us to have a peek into your life! I also have no regrets about this choice I've made and hope that in the years to come, my kids will be as close to me as Cherry's are to her. Hello emo mama! I bet it's been long since you cried after reading my post, haven't been churning out much heartfelt posts recently! Haha. Anyway thanks for saying all the kind comments, I don't think I am the perfect choice but I am just a real person who could portray the truthful side of being a SAHM. I love all their smiles too, so precious! It was also quite funny that the only time they captured Ariel crying became the beginning of the whole video. Haha. It's really nice to share our side of the story and I think many of you can identify with me on all the things I say and feel! Totally no regrets! I have that same hope too and I think we'll both get there, won't we? Jia you jia you jia you! Love it, Summer! You looked great and didn't seem nervous :-) I'm so glad that SAHMs were featured on the programme. All to easy for people to say that it's a breeze. I don't regret my choice at all. Thanks Agy! Haha I was trying to calm my nerves throughout! But it was a good challenge for me personally and I am just glad to have survived it all. I am very happy that we managed to have a voice on this show too and that I could help to show people what the day of a SAHM really looks like. I don't regret it at all too and that's the best thing, right? =) Living life with no regrets! You were so calm, matter-of-fact and articulated your thoughts well. Great job, Summer! You're doing a wonderful job as a SAHM and don't let anyone make you think otherwise! Yayyy thank you Made!!!! =) Woohoo! Awww, thanks much! I must admit that last sentence was a quote and one of my all-time favourites too! =) Hehehe. It's nice to see that SAHMs are getting a little more recognition nowadays even though it's impossible to put a value to the work we do. Well, at least I hope people start to understand that it's not as easy as it sounds and that many of us chose to do it out of a love for our kids, not because we have no choice! =) Thanks so much for reading! Great documentary, it all seems so natural! Your little girl kept smiling at the lens, so sweet! Fellow parents (Mums and Dads) considering stay-home option would be motivated by your confessions. I was moved by the episode and even more touched by this heartfelt sharing. I told David repeatedly over the next few days after that SAHMs like you have the courage to take the plunge and are mentally, emotionally and physically resilient to accept the challenges that come as a package. I'm imspired by your sharing Summer and I too found my answer today, where I see myself in 15 years. It would be a wish come true if my kids think as highly of me as Cherry's. Awww thanks Susan. Your kind comments touched my heart!!! I do try to be positive on most days but there are also the times when I think I can be a much better mum. But yes, a happy childhood for the girls is what I dream to achieve, and one that has plenty of my presence in it. Hahaha. =) I am real mah, just another mum trying to make ends meet and raise a family in our nation. =) You are an awesome FTWM who can still cook, exercise, craft, find time for the spouse, blog and I totally salute you and wonder where that energy comes from! Definitely an outstanding juggling mom! =) Let's all jia you together!! PS. Shared this post on my blog's FB page too! I am a 34yr old sahm by choice as well. My boy is only 15mths now , I quit my full time job only last year right after my maternity leave. I feel u and I am inspired. Chance upon your blog on talking point and will be your follower from now to continue get inspired. U have done well summer!! Hey, Summer! Sorry for taking so long to drop by and give you a big hug (virtually)! You did awesomely well in front of the camera. You really the best person to be in there! And I can relate every point you made, as I was a SAHM. And that 2+ years of unexpected journey taught me amazing life lessons and set my priority upside down since then. So much so, when my eldest entering P1, I decided to convert to part time mode after full-time working for 3 years. Colleagues were surprised with my decision, some were envious as they struggling in between priorities, esp mothers. I hope this is so far the best arrangement I made for the my children. We are not wealthy either, as non-local, the non-subsidies living hit us as much as you, i guess. As I enjoy my job, my kids need me at the same time. I do hope that this is a good balance I made. When time comes, I hope you will find the best next step too. I think you are really a great mum and a brave woman. My son is 4 months today, I have thought about turning into a SAHM a lot even before he came along, but in the end we find that it's too tough financially, but I had my taste these 4 months as a SAHM while on maternity leave, and it's not easy at all. There were times I thought it would have really been better to return to work. Now my son will be going into infant care in the next few weeks, frankly I do feel like crying everytime I think about not being able to be there for him all the time soon. I'm so going to miss all his smiles, laughter and little quirks and able to snap photos of him at anytime of the day. Life will be so busy with ferrying him to and fro infant care and going to work, we get to see him only a few hours a day before he rest. I am envious of and at the same time admire you, to have the courage and perserverance to become and stay as a SAHM. Maybe I'll consider this again when we are having our 2nd baby.